"Cathedral of the Dormition" redirects here. For other uses, see Cathedral of the Dormition (disambiguation). The Cathedral of the Dormition (Russian: Успенский Собор, or Uspensky sobor), also known as the Assumption Cathedral or Cathedral of the Assumption is a Russian Orthodox church dedicated to the Dormition of the Theotokos. It is located on the north side of Cathedral Square of the Moscow Kremlin in Russia, where a narrow alley separates the north from the Patriarch's Palace with the Twelve Apostles Church. Southwest is Ivan the Great Bell Tower. 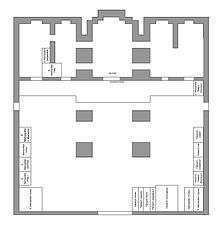 Separately in the southwest, also separated by a narrow passage from the church, is the Palace of Facets. The Cathedral is regarded as the mother church of Muscovite Russia. In its present form it was constructed between 1475–79 at the behest of the Moscow Grand Duke Ivan III by the Italian architect Aristotele Fioravanti. From 1547 to 1896 it is where the Coronation of the Russian monarch was held. 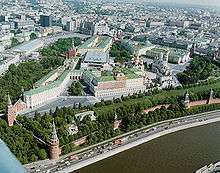 In addition, it is the burial place for most of the Moscow Metropolitans and Patriarchs of the Russian Orthodox Church. Archaeological investigations in 1968 indicated that the site of the present Cathedral was a medieval burial ground, supporting hypothesis that a wooden church existed on the site in the 12th century. This was replaced by a limestone structure built around 1326, which is mentioned in historical records. The Cathedral of the Dormition, Moscow Kremlin (east façade, winter). In the 14th century, Metropolitan Peter persuaded Ivan I (Ivan Kalita) that he should build a cathedral to the Theotokos (Blessed Virgin Mary) in Moscow like the Cathedral of the Dormition in the capital city Vladimir. Construction of the cathedral began on August 4, 1326, and the cathedral was finished and consecrated on August 4, 1327. At that time Moscow became the capital of the Vladimir-Suzdal' principality..
Dormition cathedral of Ivan Kalita. Reconstruction by Sergey Zagraevsky. Scheme of Metropolitans' and Patriarchs' graves in Cathedral. By the end of the 15th century the old cathedral had become dilapidated, and in 1472 the Moscow architects Kryvtsov and Myshkin began construction of a new cathedral. Two years later, in May 1474, the building was nearing completion when it suddenly collapsed as the drum of main cupola was being placed. Following the disaster, Ivan III then invited Aristotele Fioravanti, a celebrated architect and engineer from Bologna, Italy, to come to Moscow and entrusted him with the task of designing the cathedral from scratch in the traditions of Russian architecture. 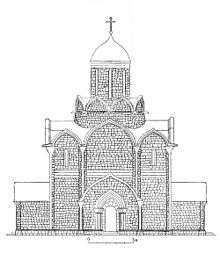 The Assumption Cathedral in Vladimir was once again taken as a model for the building, and so Fioravanti travelled to Vladimir in order to study Russian methods of building. He designed a light and spacious masterpiece that combined the spirit of the Renaissance with Russian traditions. The foundation for the new cathedral was laid in 1475, and in 1479 the new cathedral was consecrated by Metropolitan Geronty. The interior was painted with frescoes and adorned with many icons, including the Theotokos of Vladimir and Blachernitissa. The design of the new church, with its five domes (symbolic of Jesus Christ and the Four Evangelists) proved immensely popular, and was taken as a template for numerous other churches throughout Russia. In 1547 the coronation of the first Russian Tsar, Ivan the Terrible, took place in this cathedral. From 1721 it was the scene of the coronation of the Russian emperors. The ritual installation of metropolitans and patriarchs of the Russian Orthodox Church also took place in this cathedral, and their tombs are to be found here. The cathedral suffered from many disasters in its history, including fires in 1518, 1547, 1682 and 1737, and looting under the armies of the Polish-Lithuanian Commonwealth during the Time of Troubles in 1612. During the French occupation of Russia, it was looted and used as a horse stable. It was thoroughly restored in 1894-1895 and from 1910-1918. On November 21, 1917 the cathedral was the setting for the installation of Tikhon (Belavin), the Metropolitan of Moscow, as the first patriarch of the restored Patriarchate of Moscow. However, following the 1917 Russian Revolution, the new Bolshevik government closed all churches in the Moscow Kremlin, and converted the cathedral into a museum. By special permission from Vladimir Lenin, the last Pascha (Easter service) was held in 1918. The final moments of this Paschal service was the subject of an unfinished painting by Pavel Korin entitled Farewell to Rus. Most of the church treasures were transferred to the Kremlin Armory, or were sold overseas. There is a legend that in the winter of 1941, when the Nazi Germany had already reached the threshold of Moscow, Joseph Stalin secretly ordered a service to be held in the Dormition Cathedral to pray for the country's salvation from the invading Germans. The building was repaired in 1949/50, 1960 and 1978. In 1990 the Dormition Cathedral was returned to the church for periodic religious services, only a few years before the dissolution of the Soviet Union. It was restored to the Russian Orthodox Church in 1991. Dormition Cathedral is a tremendous 6 pillared building with 5 apses and 5 domes. 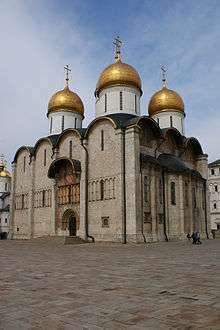 It was modeled after the Assumption Cathedral in Vladimir, in that it made extensive use of limestone masonry on a high limestone base, and was laid out as a three nave church with a vaulted cross-dome. It is built of well-trimmed white-stone blocks. However, Fioravanti did not use cantilever vaults as was common in Russian architecture, but introduced groin vaults and transverse arches. For the upper portion of the building, he used specially-made bricks, larger than the standard Russian size, which reduced weight and allowed for more slender arch supports. Thus, the easternmost pair of columns in front of the apses are typically Russian in the use of massive rectangular open piers, whereas the remaining four are simpler Corinthian columns. The slim shape of these columns contributes significantly to the light, spacious effect of the interior. Inside, the church decoration is dominated by its fresco painting. The huge iconostasis dates from 1547, but its two highest tiers are later additions from 1626 and 1653/1654 under Patriarch Nikon. 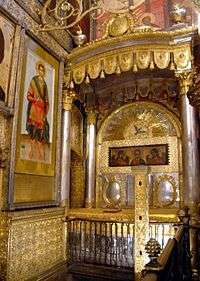 It addition to its liturgical function, the iconostasis also served as a sort of trophy wall, in that Russian Tsars would add the most important icons from cities they had conquered to its collection. One of the oldest, icons with the bust of Saint George dates from the 12th century and was transferred to Moscow by Tsar Ivan IV on the conquest of the city of Veliky Novgorod in 1561. However, one of the most important icons of the Russian Orthodox Church, the Theotokos of Vladimir kept at the Cathedral from 1395-1919 is now at the Tretyakov Gallery. 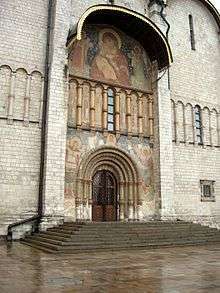 Near the south entrance to the Cathedral is the Monomach Throne of Ivan IV (1551). The plaza in front of the Cathedral is the setting for the famous Coronation Scene in Mussorgsky's opera Boris Godunov. Portion of the Iconostasis and Holy Doors of Uspensky Cathedral. Reliquary of Philip II, Metropolitan of Moscow. Inside the nave of the Cathedral. ↑ Moscow, Northern Europe: International Dictionary of Historic Places, Vol. 2, ed. Trudy Ring, Noelle Watson, Paul Schellinger, (Routledge, 2013), 497. ↑ Dmitriĭ Olegovich Shvidkovskiĭ, Russian Architecture and the West, (Yale University Press, 2007), 84. ↑ Mark M. Jarzombek, Vikramaditya Prakash and Francis D.K. Ching, A Global History of Architecture, (John Wiley & Sons, Inc., 2011), 544. ↑ Isabel de Madariaga, Ivan the Terrible, (Yale University Press, 2005), 50. ↑ Seeing the Sights in Eighteenth century Russia: the Moscow Kremlin, Lindsey Hughes, Eighteenth century Russia: society, culture, economy: Wittenberg 2004, ed. Roger P. Bartlett, Gabriela Lehmann-Carli, (LIT Verlag Munster, 2007), 320. Wikimedia Commons has media related to Assumption Cathedral in Moscow.